It’s mid-1973 and I’m about to sign away my wages for the next few years on a hire purchase agreement buying my first proper motorcycle. Sitting in the windows at Clarks of St Albans either side of the entrance door are a Yamaha RD200 and a Suzuki GT250K. My heart is set on the orange RD but my dad, who will act as guarantor for the HP, takes a shine to the GT. 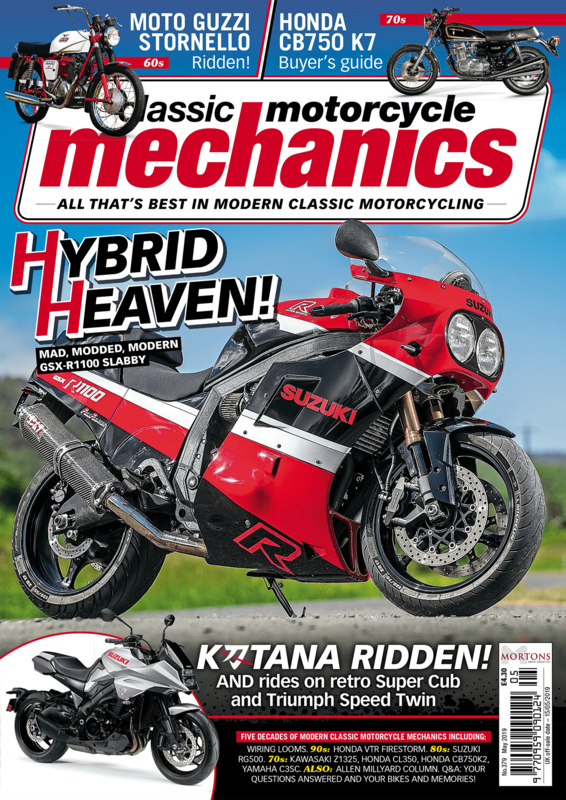 “Are you sure boy?” he asks, “the Suzuki looks like a more substantial machine!” My mind is made up: I’ve read a report by our own John Nutting raving about the Yamaha and I’ve also convinced myself that the Suzuki with its blue pin striping looks naff. Such are the illogical prejudices of impressionable teenagers. had become the most popular/best-selling learner machine in the UK bar none. 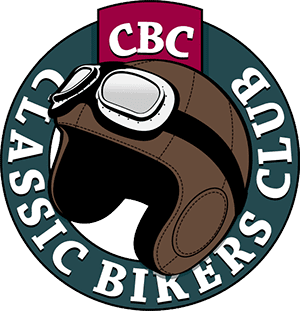 So just what was it that made the GT250 so damn prevalent? What did they have that the others apparently lacked? Was the old man right after all? Four and a bit decades on and I’m about to find out as I’m presented with the keys to an extremely tidy GT250K in that very same colour scheme. You rarely see early examples of Suzuki’s ultimate 70s learner legal stroker, with just the occasional example displayed at a show, so this is a rare event. Unarguably the bike has a certain presence to it and appears to be bigger than it actually is. Only when you throw a leg over that strangely patterned saddle does it actually come across as a 250 and not a 500. Whether this was by design or happenstance we’ll never know but it was a design ploy latterly employed by Honda when they launched the SuperDream. 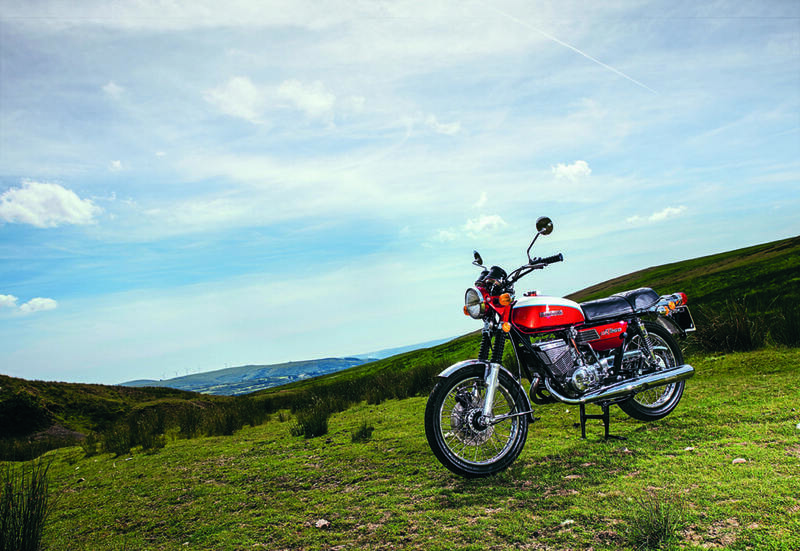 Make a 250 look larger than it is and folk are immediately impressed by it. Acres of Candy Red Paint on the tank add to the allure counterpointed by white and that curious pale blue pinstripe; yes this is definitely a child of the 70s! And that glorious red carries on to the headlamp and brackets where it’s contrasted perfectly by the satin black of the top yoke and an imposing cluster of gauges set in a moulded black plastic housing. Elsewhere there’s the obligatory acres of decorative chrome plating and buffed up alloy that so defines the period. Faux air inlets grace the red side-panels which unnecessarily leave you in no doubt whatsoever what model you’re looking at even if the throng gathered around the GT insist on reminiscing about an identical Suzuki Hustler their older brother used to own back in the day! 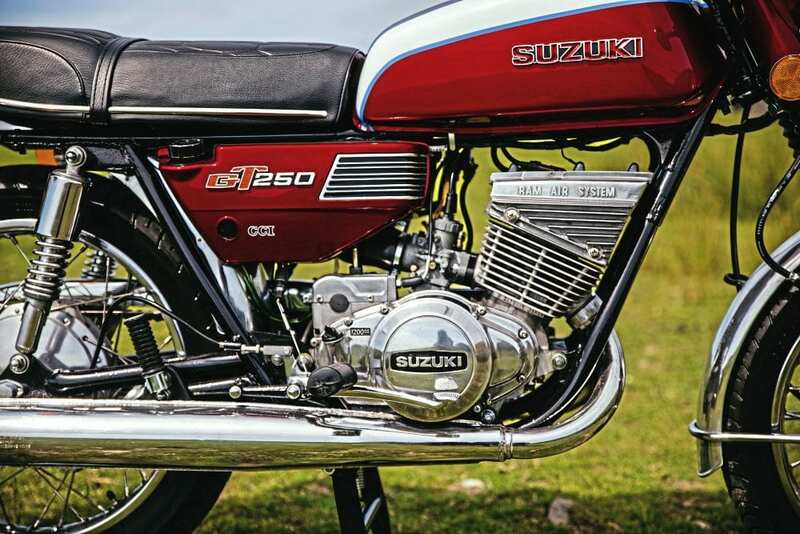 Identity issues aside, it’s a huge compliment to Suzuki’s 70s stylists that riders of today are immediately taken by the bike’s rakish good looks. And if there’s just one facet of the GT250 that gets singled out for comment then it has to be the Ram Air cylinder head cowling. Even today it’s a device that continues to split opinion among classic enthusiasts. Suzuki argued that by concentrating air flow over the cylinder head via a tapering funnel excess heat was swiftly removed from the engine. Whether the cowling had any real appreciable benefit at normal road speeds is genuinely up for debate but in all likelihood it seems improbable. Rather like installing pressurised air-boxes on modern sports bikes the advantages are more theoretical rather than actual. 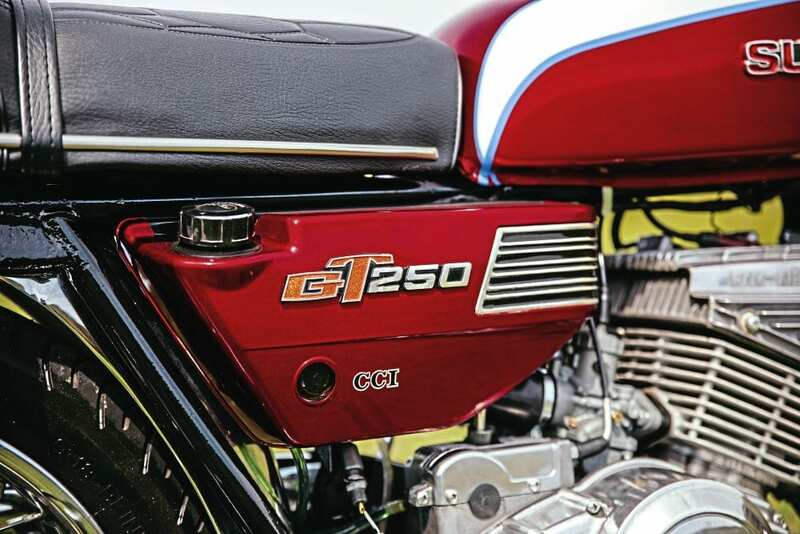 The very fact that Suzuki dropped the concept from 1976 onwards suggests the device was more affectation than effectual even if from that self-same GT250A onwards the vertical cylinder head fins aped the profile of the controversial cowling. 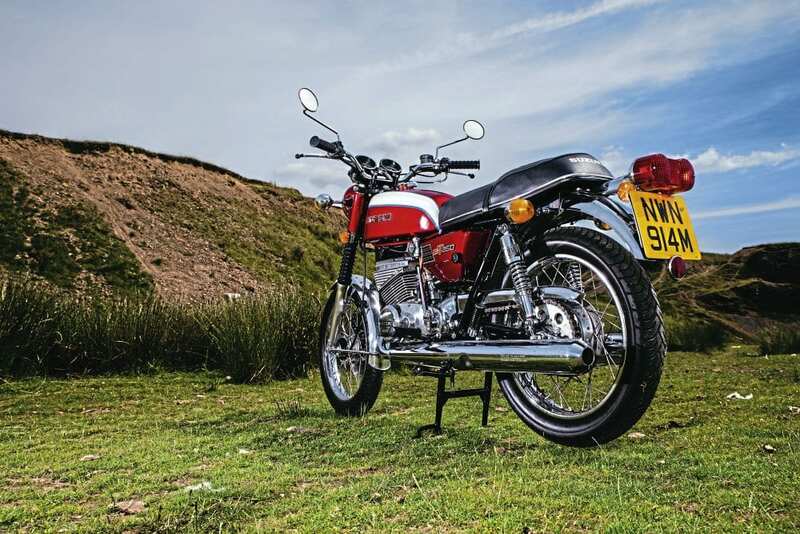 Yet whatever its virtues the Ram Air system gave owners bragging rights that the likes of Yamaha RD and Kawasaki S owners could only aspire to. So with the cosmetics and add-ons covered we’ll get onto the riding experiences. First off there’s that ever prevalent feeling of the GT being a physically larger bike than it actually is. The highish rearward angled handlebars only exacerbates this impression and this is further reinforced by that instrument binnacle which seems to imply ‘big bike’ potential. And talking of which why did Suzuki randomly scatter the idiot lights around the dash? 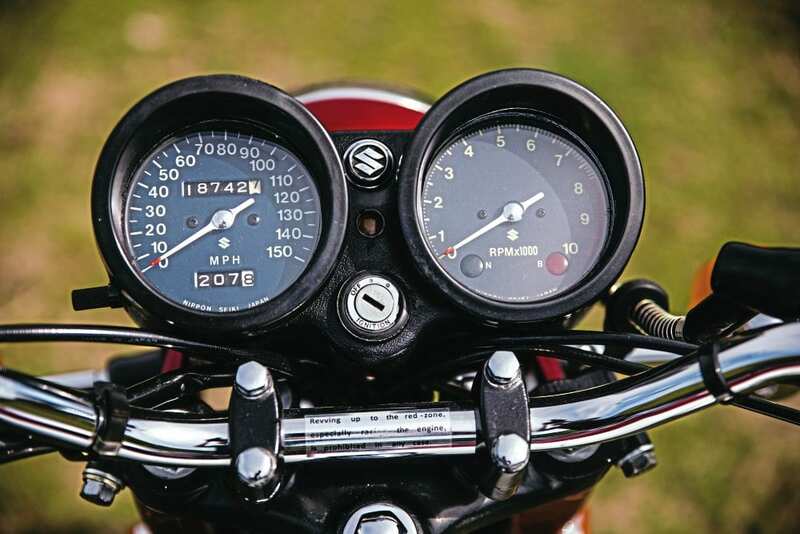 Why not either drop all three into the tacho or build a tier of them between the dials as per Kawasaki please? Starting the GT is pretty much a standard affair akin to any other 70s stroker apart from the location of the kick-start lever which is on the left. Doubtless a foible of the bike’s ancestry it’s something that you either get on with or learn to work around. Some folk can’t kick with their left foot sitting astride the bike so are obliged to stand to the side which can feel equally cack-handed. Fortunately as a serial MZ owner and long term T500 rider I’m not fazed by the set-up; choke lever down, ignition on, leave the throttle alone and kick. No need to turn on the petrol as the GT has a vacuum operated fuel tap, one more bragging right etc. Everything so far feels and is pretty much par for the course but what I’m not expecting is what happens next. The motor catches almost instantly and, hell’s teeth, there’s a lot of noise occurring! Not bore-killing piston-slap, life-limiting big-end clatter or main-bearing death rattle just… well, engine noise. For reasons completely unfathomable the GT250 just seems loud. There are anti-fin ringing castings in three sites on the barrels so it’s definitely not that. So could it simply be that the Ram Air cowl is amplifying the motor’s natural notes and tones? What’s not in doubt is the rasp of those seamed exhausts, although the legal side of loud there’s little doubt about the bike’s intended purpose… fun.